Having good wifi coverage in your center is helpful to ensure all data is uploaded promptly. After a teacher records information about a student whether attendance, photos or daily reports you'll want to have visibility to that in real-time. Tadpoles completely works offline if the device is not in coverage whether outside or on a field trip, but sometimes large centers may have areas with no wifi coverage. Depending on the size and materials used in the building your wifi network may not cover the entire building. The first thing to check is whether wifi is connected in suspect areas by taking a device into that area. You can see the signal strength at the top of the device. It will show between 0 and 3 curved bars. Ideally, you will see 3 bars but 2 should be ok. If you see 0 or 1 it would indicate a wifi upgrade might be necessary. We'll provide some options down below that are really cost effective. The most important stat is the upload speed not the download speed. Ideally you'll see something greater than 1 Mbps but 500 Kbps would suffice. If you are uploading lots of photos and videos a smaller number will just take longer for those to complete. Tadpoles will always store information to upload and will show you a number of items remaining in your outbox. One issue that can be tricky to detect is whether your access point is not allowing all devices to connect at the same time. Some home routers and older access points may only allow 5 devices at once to connect. In a large center with 20 to 30 devices then you would have a problem. If you can see the wifi network but not connect to it that's often an indication that the router is maxed out on the number of connections. The easiest solution is to replace the router/access point with a new access point that will support more connections. The Airport Express is a good option which we'll highlight below. What if you need to extend your wifi network because the building is larger than what one access point can support? To solve that problem you will need multiple access points or wifi extenders within your building. The Airport Express also provides this capability. At $99 it provides a lot of features normally found in more expensive devices. We've had many customers upgrade their wifi using this device to solve the problems above with great success. It supports up to 50 devices at once but also provides a wifi-extension capability. If you add a second or third Airport Express within range of the main Airport Express you can link them together and extend your network very easily without any wires (except the power cord). It's also really easy to setup right from your iPod or iPad. Just go into Settings -> Wifi and you'll see the new Airport Express waiting to be setup. Hopefully some of these suggestions will help you provide a simple and reliable wifi network for your childcare center! Paperless daily reports is one of the big reasons to use Tadpoles instead of using paper daily sheets. We give parents several options to receive those daily reports, but email is by far the easiest for the parent. They don't have to do anything but give you their email address! One of the areas we focus on a lot is ensuring parents always receive their daily report and that they can easily read the great information that you share. We do lots of things behind the scenes to make sure those emails don't get caught in spam filters and ensure the presentation depending on the mail client or device used to read the report. We've recently rolled out some changes that hopefully you won't notice at all! We're constantly looking to improve our service to make sure your parents are always receiving any notes, reminders or daily reports that you send them. We pushed out a minor update to the attendance detail report available on the dashboard. 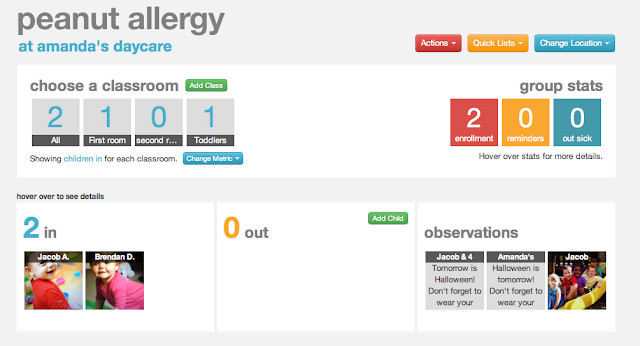 It now shows the number of hours the child was checked in so you don't have to calculate it yourself. If the child hasn't been checked out yet we show the time since they were checked in this morning. 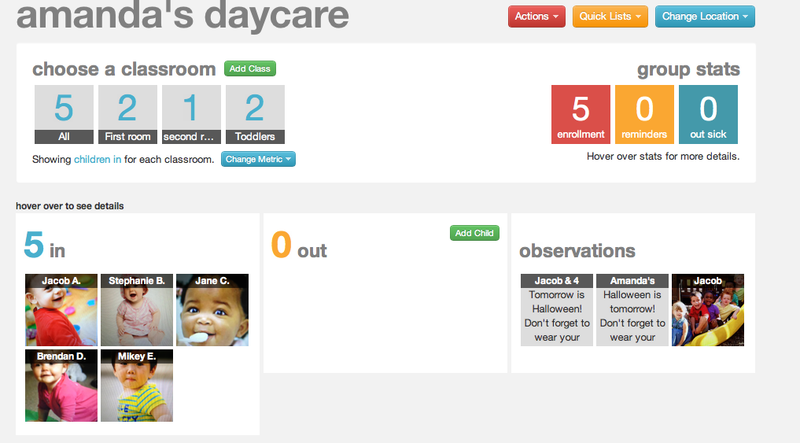 With electronic attendance for your childcare or daycare facility you can throw out those paper attendance sheets! We're rolling out a new feature tonight. At the end of the day we'll automatically check out students so that your attendance sheets for the next day starts every one out. If you need to edit the time later you can do so on the child profile screen on the device. This will also ensure daily reports are sent to parents since we will send it when the child is checked out. Hopefully this will help you save time and keep all of your parents informed! When filing daily reports, do you ever find it a hassle to rewrite a particular entry that applies to every student? Say, nap time or a special activity? 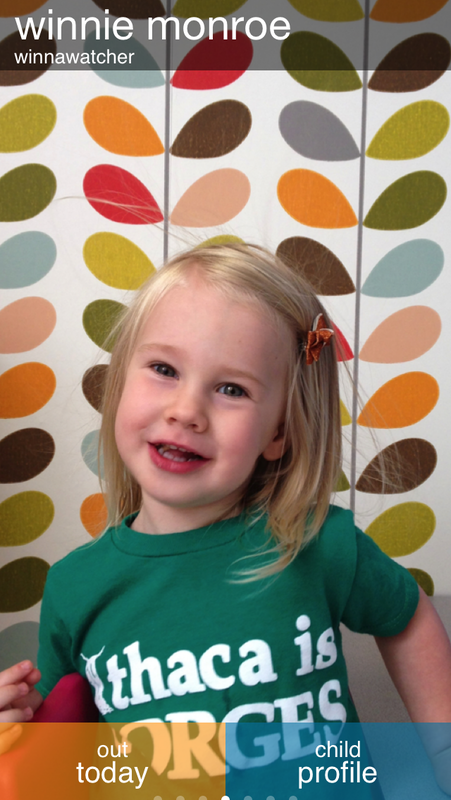 Our latest Tadpoles feature, batch daily reports, can fix that! Now, you can record a daily report entry for an entire class, rather than tediously writing out the same note for each individual child. Check out how to access this simple, quick and paperless tool! Start at the homescreen and tap "kids". We are going to file a batch daily report for the toddler class. Touch "actions" in the top right hand corner and select "daily reports". A blank childcare daily sheet will appear. At the bottom of the screen, scroll all the way to the left until it shows the classroom you want to file the batch daily report in. In this scenario, every toddler napped from 2-2:45 pm and participated in music day! These notes will be filed in every toddler's daily report. If there is an exception to one of these notes (say one child only napped from 2:30-2:45 pm), you can edit it individually in the child's report without changing the entire batch entry. After the batch report is saved, you can continue filing all other daily report entries and finish by uploading them. Saving time and paper has never been easier! The daily reports have been filed, saved, and submitted to parents, making everyone happy! Download the Childcare by Tadpoles app today! File a batch daily report yourself, and find out how quick and simple it is! When its lunchtime at your daycare or childcare center, it is always important to be mindful of kids with food allergies! But, what if you kids with food allergies in separate rooms? Is there any easier way to keep track of this? With Tadpoles, you can set up quick lists to group different kids depending on food allergies, playtime, interests, etc. In this scenario, we have a new student with a peanut allergy! Follow the steps below on how to add a child to a quick list and view one. First, start at the homescreen of the Director's Dashboard. Here, you can view all of your children that are in attendance at Amanda's daycare. Jacob has a peanut allergy, and so does our newest toddler, Brendan. 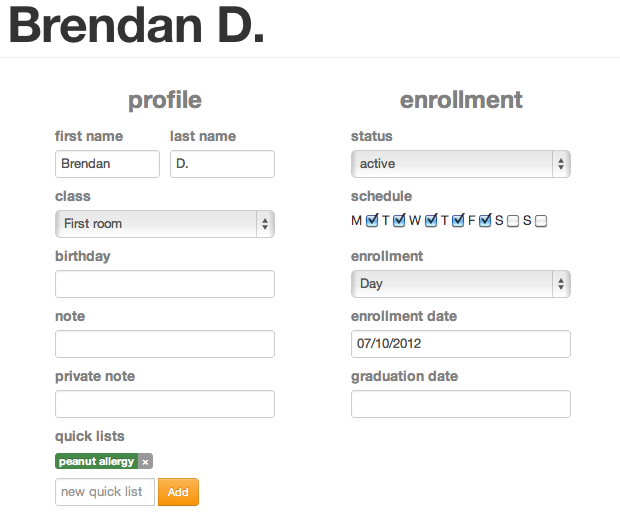 Once you click on Brendan's profile, you can view his personal info. At the bottom of the screen, you can add him to a quick list. which you can use for future reference. To view all of the children in a quick list, click on the yellow tab in the top right hand corner that says "quick lists". Once you click on it, you can then select the quick list you wish to view. In this case, we want to view all the children in Amanda's daycare in the "peanut allergy" quick list. After selecting "peanut allergy", the Director's Dashboard is reorganized to show the children that have a peanut allergy. It shows how many are in, and which rooms they are in. Brendan, our latest addition, is accounted for and ready to be checked on! Having a clear count of students with special needs makes running a daycare or childcare center a bit easier! Download the Childcare by Tadpoles app today and view your account on the Director's Dashboard to use features such as this one! email pinged and I saw this beautiful pic!! At any daycare or childcare center, it is important to be able to record, save, and share important memos with your students, staff, and parents. You should be able to record and share notes regarding special events, personal reminders, or emergencies at the touch of a button. With Tadpoles, you can record an observation or note, tag the affiliated child, and send it to parents. Very helpful for sending out class reminders! Follow these steps to access the feature! Start at the home screen a touch "share". Touch "write note" to record the observation. Tag the children under "pick kids" by tapping each profile picture. Select "parents" for visibility and either activity or incident for the type of reminder. this is what the email to parents will look like! this is what it will look like under the Director's Dashboard in the child's portfolio. 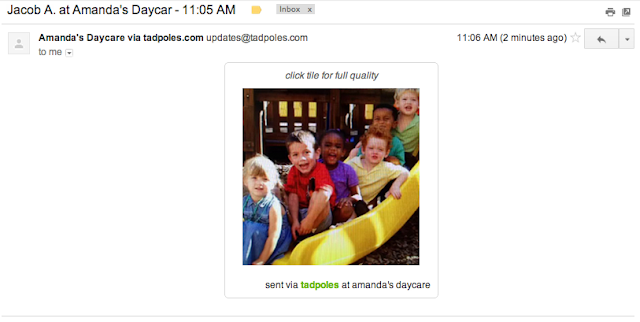 Download the Childcare by Tadpoles app today and try it for yourself! With Tadpoles, you can record observations, save them in the child's portfolio, and track them overtime! This method of paperless management makes filing reports quick and easy with the iPhone/iPad application. 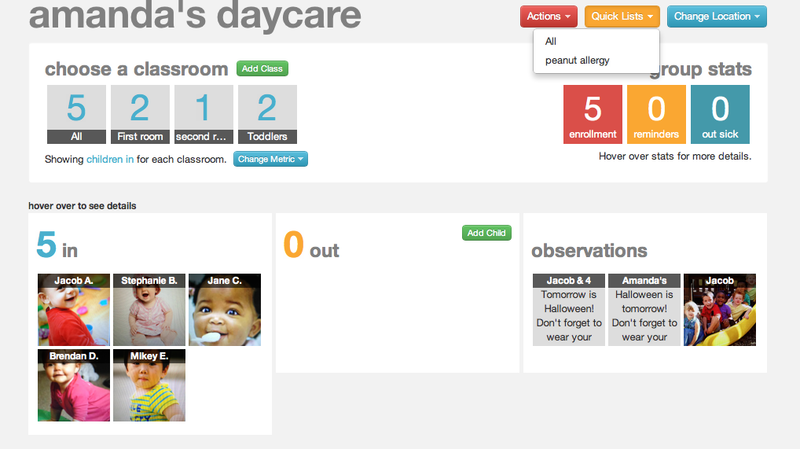 On your desktop under the Director's Dashboard, your children's notes and observations will be neatly organized! Start at the homescreen and touch "share". Then, tap the "write note" box and the bottom of the share screen. by tapping their profile picture. Select the visibility type as "portfolio" to save it to the child's portfolio for future reference. Compose the note, and add tags depending on the type of activity or incident. Refer to the Director's Dashboard to check the child's observations in his or her portfolio. 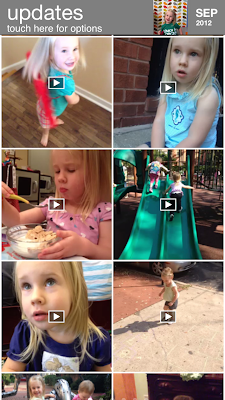 Select the child and click on the observation to read each note! Try out this feature now by downloading Childcare by Tadpoles in the App Store!